« Have Compassion for YOU! Upon further reflection I noticed how these words also apply to many aspects of midlife. 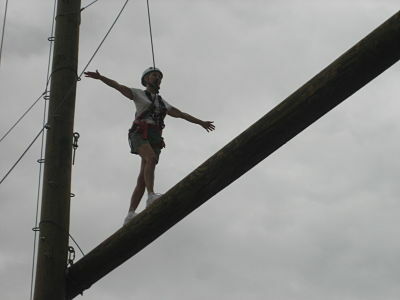 This is a photo of me walking unaided across a telephone pole 30 feet above ground. (One of those things I wanted to do the year I turned 60) I did have a loose belay line so I wouldn’t hurt myself if I fell – but I was on my own. Standing on that pole I realized that if I was going to be successful I needed to let go of my limiting beliefs and fears and pay very close attention to what I was doing… moment by moment. I found that letting go is a conscious choice – you simply turn your full attention to what you’re doing in the moment and all other thoughts dissipate. When the stakes are high, it actually becomes easier to do. When I paid close attention to what I was doing and gave no mind to distracting thoughts, I was able to not only survive the walk – but also enjoy it! So it is with midlife (heck -all of life.) Turn away from the inner voices that keep you tied to the past and focus your attention on the here and now. Perhaps you too have noticed that ALL the inner voices are about hanging on to the past or worrying about the future? Truly the only thing to fear is the idea that you would miss the life you’re having because you are so busy trying to hang on to a life gone by. Have the courage, faith and conviction to keep letting go, fearlessly, no matter what arises. There is no belay line to save you. This entry was posted on Wednesday, February 8th, 2012 at 2:10 pm	and is filed under AMAZING GRAYS Blog. You can follow any responses to this entry through the RSS 2.0 feed. You can leave a response, or trackback from your own site.